Phase One has announced the next version of Capture One, revealing a pretty big list of changes, including new ‘parametric’ and luminosity masking tools, support for some key new full frame mirrorless cameras, the addition of the Fujifilm Film Simulation modes first announced at Photokina 2018 and some significant interface and workflow changes. Capture One is the closest thing Lightroom has to a direct rival these days. It comes from Danish medium format specialist Phase One, but it will work with practically all mainstream camera brands. Its speciality is studio tethering, where it’s regarded by many pros as the standard studio tethering software, its extremely high quality raw processing tools and its precise and effective editing workflow. Interestingly, it looks as if Phase One is dropping the ‘Pro’ from the product name now. It costs more than Lightroom (prices are below), but its output from raw files is better and it offers a choice of catalog-based or ‘session’ based workflows. The new ‘parametric’ masking tools bring Capture One more into line with Lightroom’s non-destructive gradient and radial filters. Previously, once you’d created a gradient mask, for example, in Capture One, you’d have to re-create it if you wanted to change the position or angle. The new Linear Gradient and Radial Gradient masks, however, can be re-edited later, just as they can in Lightroom. That’s not all. Capture One 12 also has a new ‘dynamic’ Luma Range luminosity mask option, which masks an image based on the brightness values in different areas. The ‘dynamic’ part comes from the fact that it automatically adapts to different images, so that in principle you could create an adjustment or preset that targeted shadow areas for noise reduction (for example) and apply it across a range of images. Capture One’s very effective internal system of adjustment layers and masks already put it ahead of Lightroom for control and clarity when making local adjustments, especially since all the adjustment tools are available for each layer, so the new parametric and luminosity masks should widen the gap still further. 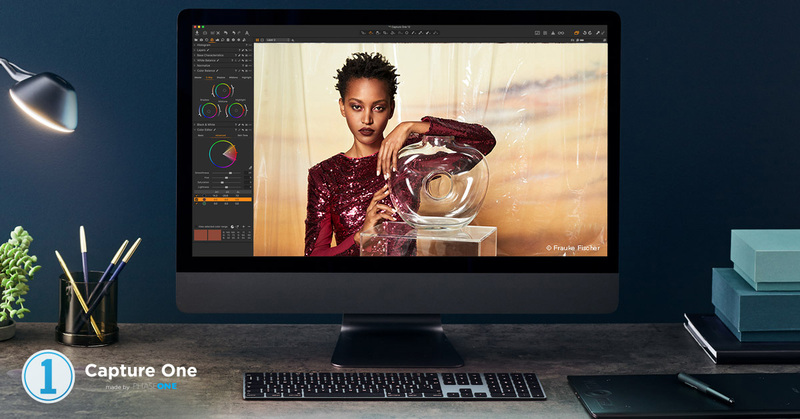 In other changes, Capture One Pro 12 adds raw support for the Nikon Z6 and Z6, the Canon EOS R and EOS M50 and the new Fujifilm GFX 50R. The two full-frame Nikons and the EOS R are crucial new cameras in the pro market, so it’s great to see them included here. Capture One now offers raw support for more than 500 cameras, and brings in-built lens correction profiles for more than 500 lenses. It’s good to see Phase One adding support for Fujifilm’s medium-format cameras because these have previously been treated as rivals to Phase One’s own medium-format camera range. Capture One 12 also makes good on Phase One’s promise to add Film Simulation modes for Fujifilm cameras, bringing profiles for 12 different film styles including Velvia, Provia and Acros. The other changes are to the interface and layout. Phase One has freshened up, restyled and reorganised Capture One’s interface to make it more logical, efficient and welcoming. Capture One 12 costs $299 for a perpetual licence (upgrade price from $149), but it’s also available in brand-specific Capture One Sony 12 and Capture One Fujifilm 12 editions which cost $219. Alternatively, you can get Capture One 12 on an Adobe-style subscription plan for $15 per month for the full version, or $14 per month for the Sony or Fujifilm versions. If you want to try it out first, you can download a fully-featured 30-day trial from the Phase One website. Hmm – well, one site told me it’s a free upgrade, for existing subscribers – another suggested a way to get a 10% discount. But when I went to the website, I was told the upgrade would cost $256 – presumably because I stuck with Capture One 10 and didn’t bother with the limited differences introduced with version 11. And like my reaction to the cost of Adobe’s Lightroom & Photoshop, that’s a bit too much, for what the upgrade provides. Sorry Rod – I’m not even going to bother downloading the free trial. Apart from what’s already in COP 10, which I already have, I can get the features I need for my post processing elsewhere – at a far lower price. I imagine the “free upgrade for subscribers” applied to those who pay for Capture One on a subscription rather than as a perpetual licence. I’ve checked my own licence upgrade route, and while the $149 upgrade only works for Capture One 11, it looks like I could upgrade for $189 using licences dating back to Capture One 7. I agree it’s a substantial upgrade fee either way, but that’s the cost of perpetual licences that many people don’t take into account. I know subscription plans aren’t popular with a lot of people on principle, but they are cost effective. As with any software, you have to like it enough to pay what the publisher is asking. As you say, there are other alternatives. I believe the free upgrade came with their Black Friday sale, which was $121 for CaptureOne Pro 11 and included a free upgrade to CaptureOne 12 when available. That meant it was cheaper than the upgrade price. That sale seems to have been only available to newsletter subscribers who did not previously own a copy of capture One.